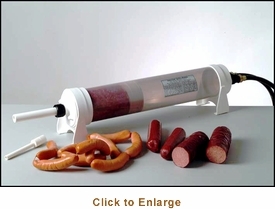 You�re viewing our Dakotah Sausage Stuffer. 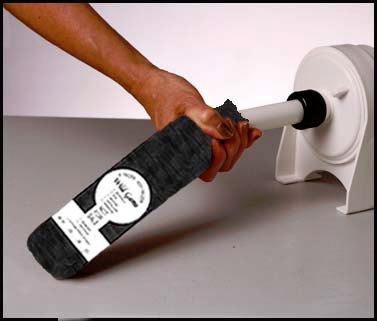 The Dakotah Sausage Stuffer is earning rave reviews among home sausage makers. It�s easy to use and no hand cranking required. This remarkable stuffer is powered by a water-driven piston which effortlessly pushes seasoned sausage meat into a variety of sausage casings and poly meat bags. 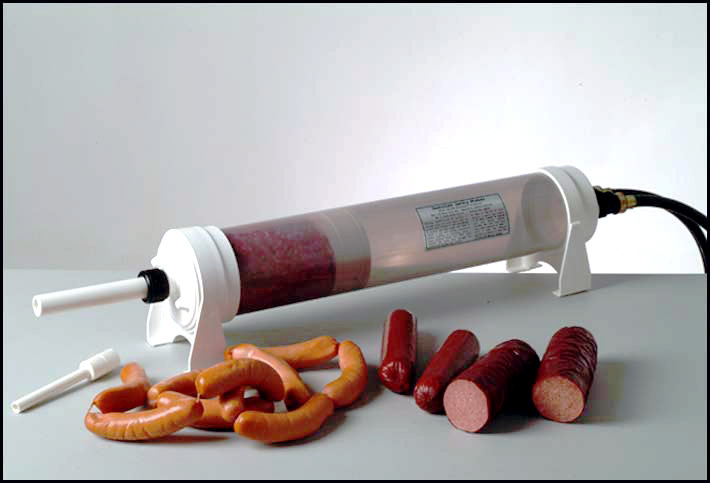 The TNT Dakotah Sausage Stuffer (DKS-240) holds 9-pounds of seasoned sausage meat and operates on a minimal 10-15 PSI of water pressure. It effortlessly pushes seasoned ground meat through the system and into a variety of sausage casings. No hand cranking needed with this stuffer, you can see exactly how much meat is in the translucent cylinder (hopper) at all times. Affordably priced to fill the niche between the low and high end sausage stuffer. Built tough in the USA from food-grade ABS Plastic. 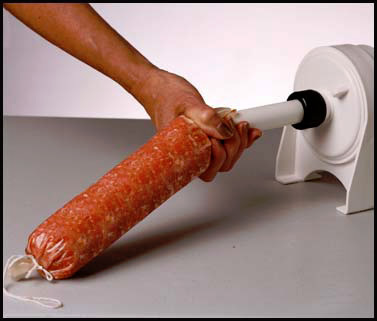 This new and improved model uses a translucent sausage stuffing cylinder that allows the operator to always knows exactly how much sausage meat is in the stuffer cylinder. Visibility eliminates the guess work and enhances the performance of this stuffing machine. Just a minimal 10-15 PSI of water pressure is required to easily fill sausage casings or stuff ground meat into freezer bags. All that is needed to operate the Dakotah Sausage Stuffer is two short lengths of garden hose. One connects the water source to the operating valve at the back of the stuffer, the other connects to the discharge valve and runs to a drain or drain bucket. The stuffer has one moving part (piston) which is sealed by two O-rings. Simply lubricate the piston, O-rings, and the mouth of the stuffer cylinder with vegetable shortening. Then push the piston to the back of the cylinder, pack it with sausage meat, screw on the head cover with sausage tube in place, slide on a sausage casing, crack open the water, and begin to stuff sausage. Home processers are continually amazed at how little effort it takes to move sausage meat through this system. Includes 3/8� and 3/4� sausage stuffing tubes. 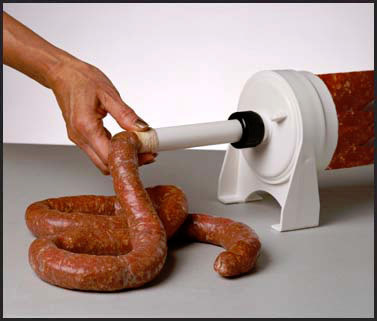 Our water powered sausage stuffer come with a manufacturer warranty. If you have questions about our products we are here to help you. Scroll down to view our Dakotah Sausage Stuffer. Operates on a minimal 10-15 PSI of water pressure. Effortlessly pushes seasoned ground meat through the system and into a variety of sausage casings or meat bags. Translucent cylinder allows operator to always see exactly how much meat is in the hopper. Built tough in the USA from food-grade ABS Plastic. Includes 3/8� and 3/4� sausage stuffing tubes. Attaches to standard garden hose.